“I’m so excited about this fight. 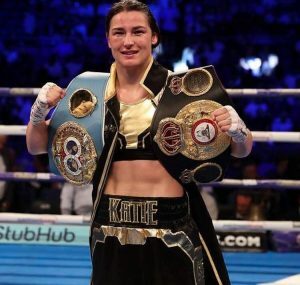 The fact it’s in Boston means it’s going to be like a home from home for me in there with all the Irish support.” These words, which come from the mouth of Ireland’s Katie Taylor, the women’s WBA and IBF lightweight titlist, make one thing clear – she’s looking forward to facing the 27-5-3 Cindy Serrano at Boston’s TD Center Saturday night on the undercard of the Demtrius Andrade – Walter Kautondokwa middleweight title bout. This weekend will mark the 10-0 Taylor’s third fight stateside and will be aired live via DAZN streaming service. Things have clearly gone well for Taylor since she turned pro back in 2016. “I love fighting in the US and this is a really big fight with a big name on a huge platform in Boston and on DAZN,” she says. “These are the kinds of fights that I am in the sport for.” Fighting in Boston, with its huge Irish American population, will unquestionably give the 32-year-old a boost. Things haven’t always been easy on Taylor. A documentary, “Katie” details the fighter’s struggles both in the ring and with her family. With that in mind, the fighter has been able to forge herself a perfect record in the nearly two years since turning pro and has no intention of letting up as she watches her star begin to rise. Serrano, however, clearly has other plans. The Brooklyn based fighter hasn’t lost since 2012. She’s also the sister of noted champion Amanda Serrano, owner of the WBO women’s super-lightweight title.